I am writing this as an addendum to two previous posts. Like many others, I received the following email from the web clipping service Amplify yesterday. As I explained in my ‘Account Management’ post, I decided that I want to ‘own’ my data and also improve my productivity by reducing my digital footprint. The process of exporting various data: images, posts… was reasonably straight forward. In many cases it took a couple of emails. In the best cases, it simply involved logging in and clicking ‘delete this account’. However, I was unable to close my Amplify account. I sent emails and tweets but received no replies. I had to live with a ‘redundant’ open account that I was not using anymore. Even getting rid of the behemoth that is Facebook was easier. 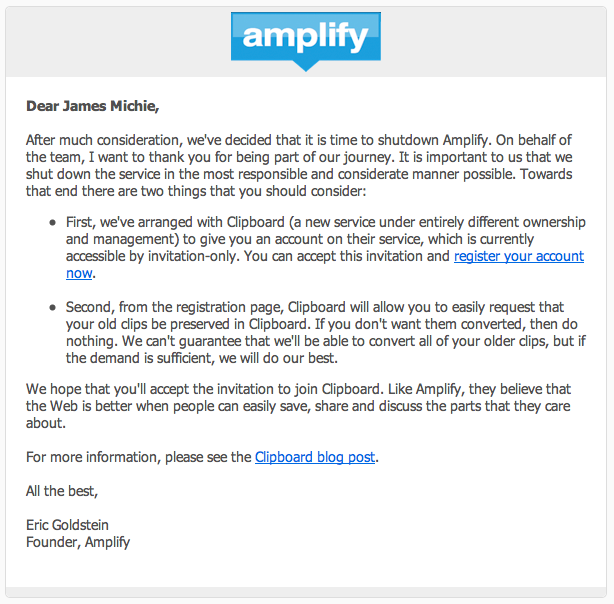 With the closure of Amplify, this matter has now been resolved, although not in the manner I would have liked. I wish no ill will towards Eric or anyone else that worked on Amplify. I am positive that their intentions with the service were entirely honourable and I know for a number of people, the model of clipping and sharing was a highly effective way to discuss content on the web. However, I think it was wrong that as a ‘user’ of the service, there was no way for me to close my account and/or liberate my data. I would encourage everyone to think carefully about the online services and tools they sign up with. Before you sign up or request an invite, find out as much about them as you can. What are they going to do with your data? Who will have access to it? If you want to get your data out, can you? If you want to stop using the service and delete your account, will you be able to? A brief audit of edtech tools (I may have missed a few!) in no particular order/preference.